DAB enjoy the convenience of listening to your favourite radio stations in crystal clear digital quality. ¬ CA-AN-DAB.001 (DAB antenna). It plays DAB/DAB Digital Radio, audio/video content from CDs, DVDs and USB devices. DAB Digital Radio (fully integrated). Designed to bring the connected lifestyle into your car, the DEH-X8500DAB not only plays back CDs; it also plays tunes from your iPod, iPhone, Android smartphone or USB stick. Use the integrated Parrot Bluetooth to make hands-free calls or to stream audio from compatible devices. The rear Aux In and USB input connect your iPod, iPhone or other device while keeping your car free of cable clutter (1 cable included). It plays DAB/DAB Digital Radio, audio/video content from CDs, DVDs and USB devices. Pioneer AVH-Z3100DAB. • CA-AN-DAB.001 (DAB antenna). Apple CarPlay Is the smarter, safer and more fun way to use your iPhone® in the car. 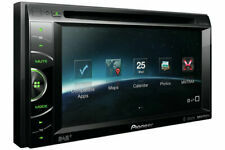 Pioneer AVH-X3500DAB / DAB / DVD / Bluetooth / USB / 2 DIN . Condition is Used. This unit was in mint condition when removed from my old car, which has recently been sold. I was unable to remove all the components, so the only connectors and accessories that will be dispatched with the unit are those photographed. The others are readily available on-line. Dispatched with Royal Mail 2nd Class. 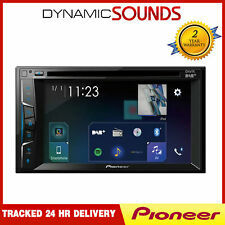 PIONEER deh-150mp car stereo cd radio player Bluetooth,aux input. Car stereo cd radio player PIONEER deh-150mp. PIONEER deh-150mp. rafio fm/mw/Lw tuner RDS. Bluetooth adaptor handfree calls & steaming music. front-AUX INPUT for ipod&iphone&mp3 player. compact audio discs. Bluetooth With Stream Music. More info,manual instruction. link below. THE PHOTOS SHOW THE ITEM BEING SOLD. GOOD CONDITION. 1 RCA OUTPUT. DAB Digital Radio. - Universal DAB aerial. - Bluetooth with Stream Music. - Rear USB and AUX. - USB cable. -CD, FLAC, DVD, DivX, XviD, WMA, WAV, MP3 and AAC. (No:1819408). THE PHOTOS SHOW THE ITEM BEING SOLD. (No:1819414). OEL DISPLAY. THE RADIO HAS SINGNS OF USE. THE PHOTOS SHOW THE ITEM BEING SOLD. Bluetooth With Stream Music. Back USB (USB cable is included). More info,manual instruction. link below. THE PHOTOS SHOW THE ITEM BEING SOLD. GOOD CONDITION. Animated Display. 3 RCA OUTPUT. Front Aux & USB. PIONEER DEH-X3800Ui. THE PHOTOS ARE OF THE ACTUAL CD RADIO PLAYER YOU WILL RECEIVE. This radio is used so there may be marks. Nothing more than shown in photos. Pioneer DEH-1500UB, includes cable connector, manual, and facia surround. Files supported include WMA and MP3, as well as CD & FM Radio. Pioneer DEH-2700UI. ( not sure if it was tested with iphone or ipod). MP3 Text Display ( ). CD Text ( ). 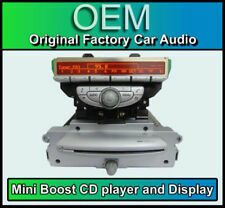 THE PHOTOS ARE OF THE ACTUAL CD RADIO PLAYER YOU WILL RECEIVE. Black LCD Display with white text (1 line with 12 characters). Pioneer Keh-9700 R. Condition is New. Dispatched with Royal Mail 2nd Class. Pioneer AVH-X8700BT. I believe I have updated the stereo to software version 1.10, but another update is available on the Pioneer support page. Built-in MirrorLink - Built-in MirrorLink allows you to mirror your compatible smartphone's display to that of your car and access certain music and map applications for a more convenient and safer in-car experience. 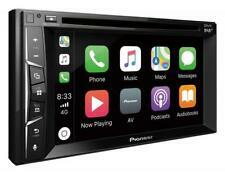 2-DIN Multimedia DVD Receiver with 6.1" WVGA Touchscreen Display, MIXTRAX, Bluetooth®, and AppRadio Mode for iPhone® Pioneer Avh-x2600bt. Condition is Used. Dispatched with Royal Mail 2nd Class. Connect your phone to the Pioneer DEH-P9800BT and use it as a carkit. Also the DEH-9800BT has all the audio settings needed for professional use with multiple amplifiers. Top model Pioneer Bluetooth head unit DEH-P9800BT was £600. Used pioneer double din headunit. Works perfectly. Has usual wear and tear as seen in pictures. Come with CD/DVD, USB and AUX input. Citroen C1 Bluetooth CD Player, CD/USB radio stereo -. This is a Citroen C1 Bluetooth CD player which also includes USB compatibility, if your car has a factory fitted USB port this stereo. Fits Citroen C1: 2010 - 2014. HONDA CIVIC CRV CR-V S2000 CD RADIO AUX PLAYER PIONEER . Taken form a 2005 S2000. Does not come with a code as I've sold the car some years ago and forgot to note it down. Radio code available on eBay for 99p or I have the car VIN so you could request it from a dealer. Dispatched with Royal Mail 2nd Class. On top, it supports the latest connectivity options for your smartphone, such as Apple CarPlay, Android Auto, Bluetooth and more. Wait no longer and get truly connected in a much smarter and safer way. Peugeot Expert car stereo RD4 car radio stereo | RD4 stereo for Peugeot. Peugeot 107 Bluetooth CD Player, CD/USB radio stereo -. This is a Peugeot 107 Bluetooth CD player also includes USB compatibility, if your car has a factory fitted USB / AUX port this. Pioneer DEH-4900DAB 50 x 4 Watts Single Din DAB Tuner iPod/iPhone Direct Conrol USB CD MP3 AUX Android Car Stereo Radio Player - 2 Pre Outs (Red Display). Tuner DAB Tuner. DAB Functions Auto DAB Tuning. Next generation CD Tuner with Bluetooth, USB, DAB/DAB and Spotify. Connects to Apple iOS & Android devices. Enjoy the convenience of listening to your favourite radio stations in crystal clear digital quality with DAB . This is a great stereo head unit. Just taken it out of my car as sold the car but it won’t fit in my new one. It works perfectly and great sound. I paid 350 for it new. Just linked this for reference of description. On some sites they still want 250 new. RGB Multi Colour Illumination. Pioneer DEH-X2900Ui. THE PHOTOS ARE OF THE ACTUAL CD RADIO PLAYER YOU WILL RECEIVE. Front USB and Aux-In. This radio is used so there may be marks. FITS CR-V CIVIC AND S2000 MODELS. COMPATIBLE WITH CD CHANGER. HONDA CD RADIO AUX PLAYER. COMPATIBLE WITH AUX. MANUFACTURED BY PIONEER. SUPPLIED WITH SECURITY CODE. D4Q RDS Tuner. Optional Add-On DAB Tuner. Manufacturer: Pioneer. MP3 and WMA Support. Remote and Face unit box Included. Selectable Loudness. Source Level Adjuster. Level Indicator. Pioneer FH-X840DAB - CD USB Bluetooth DAB Apple Android Stereos. Its integrated DAB/DAB tuner lets you enjoy crystal-clear digital audio and interference-free reception. DAB / DAB Functions. Automatic Tuning DAB. In excellent used condition as shown. 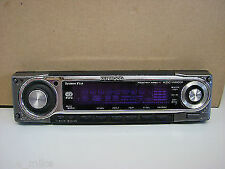 Car stereo cd player PIONEER deh-1400UB. AUX INPUT. PIONEER deh-1400UB. radio-fm/am tuner RDS. audio compact discs.